AMD Game? no Thx, After they screwed me over in the 4x4 crap? AMD has this problem as they just do some paper launch, get the media attention they want, then they will turn around and completely ignore their promises. Look at 4x4. AMD is now a chartware powerhouse. The merger with ATI has taken their chartware to unprecedented heights. To be fair, AT also did a piece on NV's ESA certification branding, which isn't much more exciting. It's something pertinent to computer enthusiasts, so we discussed it. If Intel comes out with their alternative to "GAME!" tomorrow, we'd likely have an article on that as well. It's part of covering the computer technology market. 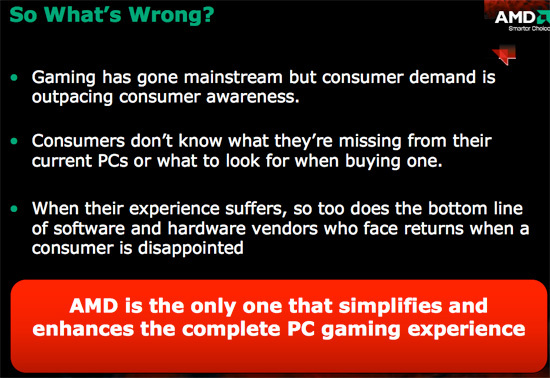 Personally, static definitions for the gaming market are way too complex IMO. What would be far better is if gaming companies would get on board with these definitions. 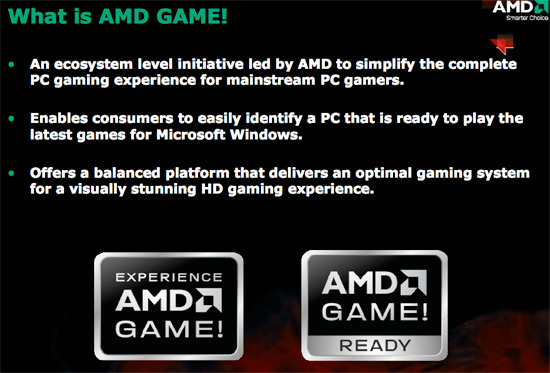 Then we could have AMD (or Intel) release basic levels like "Game! - Mainstream 2007", "Game! - Performance 2007", etc. and update those each year. "Game! - Performance 2007" may end up being about the same as "Game! - Mainstream 2008", but as long as the box points at a specific specification users should be better off. Frankly, the current "This game requires a DX9 card with 128MB RAM" is woefully inadequate. 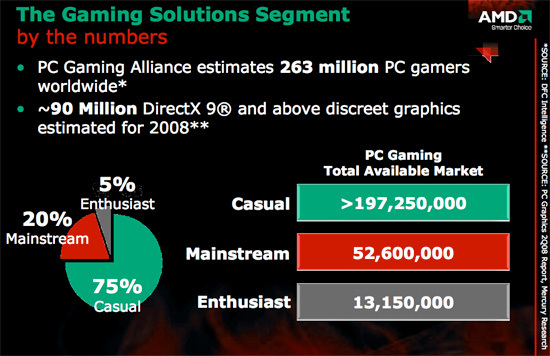 I like the theory of what AMD is doing; it's getting representation for lots of other games into the mix that concerns me. HL2 EP2 isn't nearly as demanding as Crysis or World in Conflict - or several other titles we could list. Don't even get me started on including WoW, Zoo Tycoon 2, Sims 2, and Sins of a Solar Empire -- those are fine games for a lot of people (although I only play Sins much), but all should run fine on pretty moderate hardware. We also don't know what settings they're using; Sins at minimum details is different than Sins at maximum details for example.